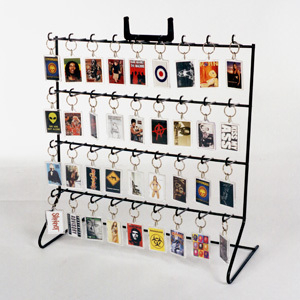 Whether you are selling keyrings and other merchandise as gifts or as part of your company’s branding, Jack Sayers Ltd merchandise display stands will suit your requirements. All displays have headerclips and floor spinner stands have plastic bases with castors (2 of which are braked). Most of our stock items are powder coated in silver, other choices are available. Contact us today to ask as any questions or order your display stands for keyrings and merchandise. All displays have headerclips and floor spinner stands have plastic bases with castors (2 of which are braked).